Show, Don't Tell is a piece of editorial advice I find myself giving in almost every edit I do. A reader will feel much more emotionally involved in your characters plight if you show how they are feeling through their actions and dialogue, trusting the reader to interpret what is happening and leaving them to put some effort into reading between the lines. 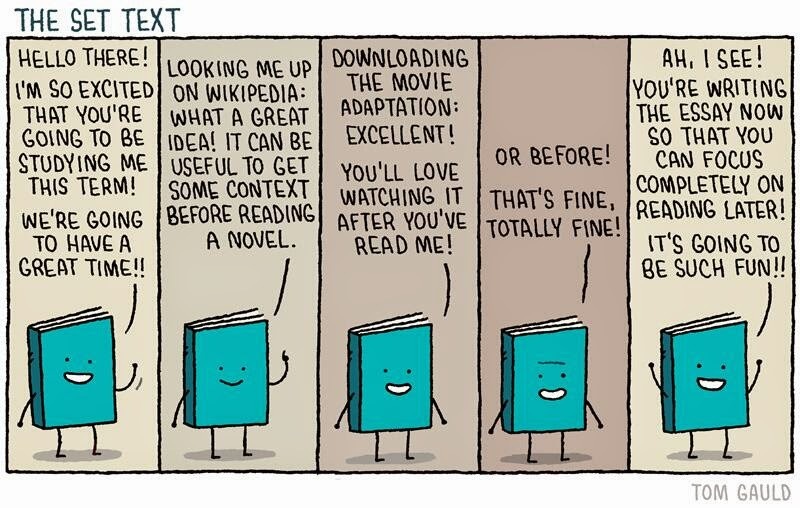 By the end of this cartoon the reader feels genuine emotion for the book. Despite its relentless positivity the progression shows the reader that whoever the book is talking to is not as excited by the prospect of reading it as it is of being read. We can interpret that the book is about to be hugely disappointed and we empathise. But, at no point have we been told how the book feels about what is happening - we've worked it out for ourselves, put ourselves in the book's position and, as a result, felt far more than we would if the cartoonist had told us more fully what was happening.